Wayfarer was one of my most anticipated reads of 2017. I have been looking forward to this book since last summer when I read Passenger. I fell in love with the characters and felt like my heart was ripped out of my chest in the last few cliff-hanger moments in Passenger. 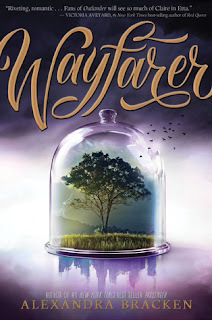 So you can imagine, when Wayfarer hit the shelves, I was immediately diving in. The book picked up right where Passenger left off and the characters were just as wonderful as i remembered. Bracken does such an incredible job with all of the details involved in a story based on time travel. There were definitely moments where I had to go back and re-read a few pages, but the writing was spot on and beautiful. The amount of research and planning that went into this book is hard to think about! Bracken also did a remarkable job of handling the topics of race and sexuality. I loved how the characters were strong, well-rounded, and stood up for what they believed in. I loved about 98% of the story, but with every book, there is always something I wish went a little differently. There were a few parts that were a little slow, and I really wanted Etta and Nicholas to have more time together because I just love their relationship SO much! I think it made the in between portions of the story more enjoyable though, because I was constantly hoping for them to miraculously run into each other. All in all, Wayfarer was a beautifully written story with the same amazingly complex characters, and a few new characters who I fell in love with as well. I would highly recommend reading Passenger and Wayfarer if you are a YA lover or if you love historical fiction. Well done Bracken!